LAKE GENEVA, Wis. (WITI) -- A dog was rescued and resuscitated by firefighters after an unusual situation Wednesday, January 18th in Lake Geneva. Five vehicles caught fire in a Wal-Mart parking lot. The thick, black smoke could be seen for miles. Several people whipped out their cell phones and shared the video with FOX6 News. Witnesses could hardly believe what they were seeing. "From the distance, I could see smoke in the sky," Tyler Lawson said. The blaze even had firefighters taken aback. "(The vehicles) are in close proximity and once one gets going, it`s easy to spread," Mark Moller-Gunderson, Lake Geneva fire chief said. At around 1:00 p.m. Wednesday, investigators said a Walmart employee was popping out for lunch and noticed flames coming from a vehicle. "And it spread! It eventually involved five cars," Moller-Gunderson said. Firefighters pull dog from terrifying fire in Wis.
A dog was rescued and resuscitated by firefighters after an unusual situation Wednesday, January 18th in Lake Geneva. Moller-Gunderson said he's never seen anything quite like it before. Two vehicles were destroyed, and three others were badly damaged. It took an hour to put the fire out. "We had to use foam and dry chemicals to get at hot spots to get it done," Moller-Gunderson said. Inside one of the vehicles -- a dog! "I heard that maybe there was a dog that was injured," Lawson said. 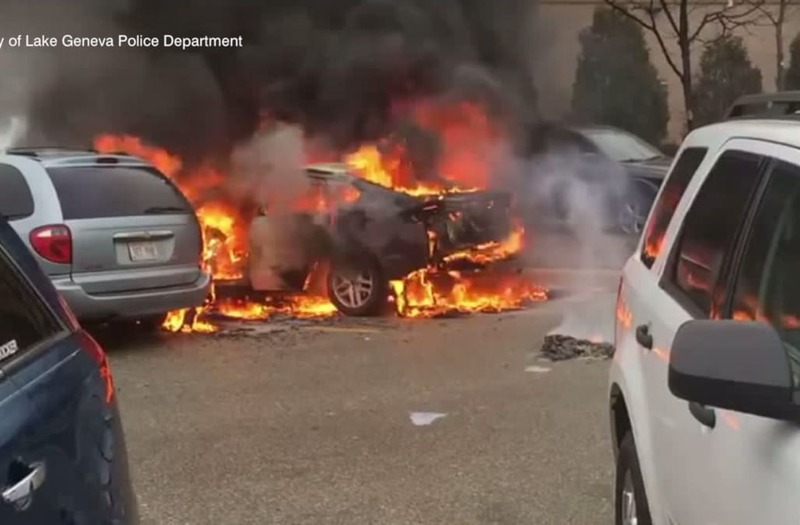 Moller-Gunderson said his team pulled a Siberian Husky from one of the burning cars. Firefighters had to resuscitate the dog. "(The dog) wasn't doing too well because (the dog) had a lot of smoke. It was an older dog," Moller-Gunderson said. The dog was taken to a veterinarian, and FOX6 News was told the dog is doing well. "We carry equipment for that. We carry oxygen masks for dogs and cats," Moller-Gunderson said. Hours later, black soot still filled the parking spot next to where Lawson was parked. "I didn't really notice that until you pointed it out. Yeah, that's pretty serious," Lawson said. "This one we could see from a distance. We had a lot going," Moller-Gunderson said.